Space debris populations seen from outside geosynchronous orbit. The terms space debris, space junk, orbital debris, and space waste refer to human-made objects in space that no longer serve any useful purpose. They range from entire spent rocket stages and defunct satellites to explosion fragments, paint flakes, dust, slag from solid rocket motors, coolant released by RORSAT nuclear powered satellites, small needles once used for radio communications, and smaller particulate matter. Space debris has become a growing concern in recent years, for several reasons. For example, collisions at orbital velocities can be highly damaging to functioning satellites and can produce additional space debris in the process, called Kessler Syndrome. Also, clouds of very small particles may cause erosive damage, similar to sandblasting. Astronauts engaged in extra-vehicular activity are also vulnerable. Some spacecraft, such as the International Space Station, are now armored to mitigate damage from this hazard. Several other strategies have been proposed to minimize the generation of additional space debris, but current efforts are focused on preventing collisions in space. The "energy flash" of a hypervelocity impact during a simulation of what may happen when a piece of orbital debris hits a spacecraft in orbit. In 1958, the United States launched a satellite named Vanguard I. It became one of the longest surviving pieces of space junk, and as of March 2008, remains the oldest piece still in orbit. According to Edward Tufte's book, Envisioning Information. space debris objects have included a glove lost by astronaut Ed White on the first American space-walk, a camera Michael Collins lost near the spacecraft Gemini 10, garbage bags jettisoned by the Soviet Mir cosmonauts throughout that space station's 15-year life, a wrench, and a toothbrush. Sunita Williams of STS-116 also lost a camera during an EVA. During the EVA to reinforce a torn solar panel during STS-120, a pair of pliers was similarly liberated. Most of those unusual objects have re-entered the atmosphere of the Earth within weeks due to the orbits where they were released and their small sizes. Things like these are not major contributors to the space debris environment. On the other hand, explosion events are a major contribution to the space debris problem. About 100 tons of fragments generated during approximately 200 such events are still in orbit. Space debris is most concentrated in low Earth orbit, though some extends out past geosynchronous orbit. The first official Space Shuttle collision avoidance maneuver was during STS-48 in September 1991. A 7-second reaction control system burn was performed to avoid debris from the Cosmos satellite 955. Spatial density of space debris by altitude according to ESA MASTER-2001. In order to mitigate the generation of additional space debris, a number of measures have been proposed. For example, the passivation of spent upper stages of rockets by the release of residual fuels is aimed at decreasing the risk of in-orbit explosions that could generate thousands of additional debris objects. Taking satellites out of orbit at the end of their operational life would also be an effective mitigation measure. This could be facilitated with a "terminator tether," an electrodynamic tether that could be rolled out, slowing down the spacecraft. In cases where a direct (and controlled) de-orbit would require too much fuel, the satellite can also be brought to an orbit where atmospheric drag would cause it to de-orbit after some years. Such a maneuver was successfully performed with the French Spot-1 satellite at the end of 2003. It will re-enter in approximately 15 years. For orbital altitudes where it would not be economically feasible to de-orbit a satellite, as in a geostationary ring, satellites may be brought to a "graveyard orbit," where no operational satellites are present. Proposals have been made for ways to "sweep" space debris back into Earth's atmosphere, including automated tugs, laser brooms to vaporize or nudge particles into rapidly-decaying orbits, or huge aerogel blobs to absorb impacting junk and eventually fall out of orbit with them trapped inside. Currently, however, most efforts are being devoted to preventing collisions by keeping track of larger debris, thus preventing the formation of additional debris. Other ideas include the gathering of larger objects into an orbital "junk yard," from where they could be tapped for possible resources in the future, while keeping them out of the way. The U.S. Strategic Command is maintaining a catalog currently containing about 10,000 objects, also to prevent misinterpretation as hostile missiles. Observation data gathered by a number of ground based radar facilities and telescopes as well as by a space based telescope is used to maintain this catalog. Nevertheless, the majority of debris objects remain unobserved. There are more than 600,000 objects larger than 1 cm in orbit (according to the ESA Meteoroid and Space Debris Terrestrial Environment Reference, the MASTER-2005 model). Other sources of knowledge on the actual space debris environment include measurement campaigns by the ESA Space Debris Telescope, TIRA, Goldstone radar, Haystack radar, and the Cobra Dane phased array radar. The data gathered during these campaigns is used to validate models of the debris environment like ESA-MASTER. Such models are the only means of assessing the impact risk caused by space debris as only larger objects can be regularly tracked. Returned space debris hardware is also a valuable source of information on the (submillimeter) space debris environment. The LDEF satellite deployed by STS-41-C Challenger and retrieved by STS-32 Columbia spent 68 months in orbit. The close examination of its surfaces allowed the analysis of the directional distribution and the composition of debris flux. The EURECA satellite deployed by STS-46 Atlantis in 1992, and retrieved by STS-57 Endeavor in 1993, could provide additional insight. The solar arrays of the Hubble Space Telescope returned during missions STS-61 Endeavor and STS-109 Columbia, are an important source of information on the debris environment. The impact craters found on the surface were counted and classified by ESA to provide another means for validating debris environment models. Gabbard diagram of almost 300 debris from the disintegration of the 5-month-old third stage of the Chinese Long March 4 booster on March 11, 2000. The spread of debris to longer orbital periods and higher apogees indicates that those pieces of debris were propelled in the prograde direction. Space debris groups resulting from satellite breakups are often studied using scatterplots known as Gabbard diagrams. 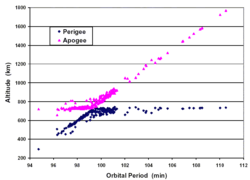 In a Gabbard diagram the perigee and apogee altitudes of the individual debris fragments resulting from a collision are plotted with respect to the orbital period of each fragment. The distribution of the resulting diagram can be used to infer information such as direction and point of impact. The largest space debris-creation incident in history took place during the Chinese anti-satellite weapon (ASAT) test on January 11, 2007. The event generated more than 2000 pieces of trackable debris (approximately golf-ball size or larger), estimates of over 1 million pieces 1 mm or larger, and over 35,000 pieces 1 cm or larger. That event was more significant than previous ASAT tests in that the debris field is in a higher orbital plane, resulting in deorbit times of 35 years and more. In June 2007, NASA's Terra environmental spacecraft was the first to be moved in order to prevent impacts with this debris. An event of similar magnitude occurred on February 19, 2007, when a Russian Briz-M booster stage exploded in orbit over Australia. The booster had been launched on February 28, 2006, carrying an Arabsat-4A communications satellite, but it malfunctioned before it could use all its fuel. The explosion was captured on film by several astronomers, but due to the path of the orbit the debris cloud has been hard to quantify by radar. 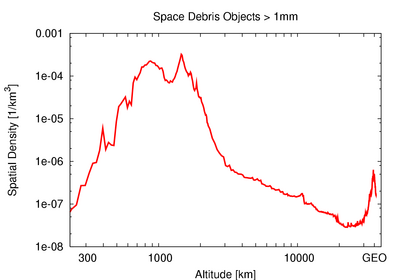 Although similar in magnitude, the debris field is at a lower altitude than the Chinese ASAT test and much of the debris has reentered the atmosphere in a relatively short time. As of February 21, 2007, over 1,000 fragments had been identified. A third breakup event also occurred on February 14, 2007, as recorded by Celes Trak. Thus, there were three observed debris-creation events in the first two months of 2007. Eight breakups occurred in 2006, the most since 1993. The first verified collision with cataloged space debris occurred in 1996, tearing off a boom from the French satellite Cerise. As of September 2006, Lottie Williams was on record as the only person ever to be directly hit by human-made space debris. While walking in a park in Tulsa, Oklahoma, on January 22, 1997, at 3:30 a.m., she noticed a light in the sky that she said looked like a meteor. Minutes later, Williams was hit in the shoulder by a 10 x 13 cm. piece of blackened, woven metallic material that was later confirmed to be part of the fuel tank of a Delta II rocket which had launched a U.S. Air Force satellite in 1996. Ms. Williams was not injured. ↑ United Nations, Technical report on space debris. Retrieved May 28, 2008. ↑ K. Thoma, M. Wicklein, and E. Schneider, Proceedings of the 4th European Conference on Space Debris (ESA SP-587) (ESA/ESOC, 2005). ↑ USA Weekend, Space junk. Retrieved May 28, 2008. ↑ Bill Chistensen, The Terminator Tether Aims to Clean Up Low Earth Orbit. Retrieved May 28, 2008. ↑ Grant H. Stokes, Curt von Braun, Ramaswamy Sridharan, David Harrison, and Jayant Sharma. The Space-Based Visible Program. Retrieved May 28, 2008. ↑ David Portree and Joseph Loftus, Orbital Debris: A Chronology. Retrieved May 28, 2008. ↑ Center for Space, Chinese ASAT Test. Retrieved May 28, 2008. ↑ www.space.com, NASA's Terra Satellite Moved to Avoid Chinese ASAT Debris. Retrieved May 28, 2008. ↑ Celestrak.com, Recent Debris Events. Retrieved May 28, 2008. 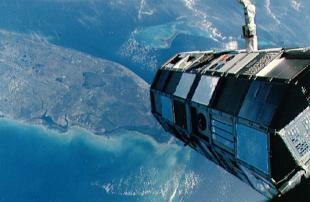 ↑ BBC, CO2 prolongs life of space junk. Retrieved May 28, 2008. ↑ Today in Science History, January 22. Retrieved May 28, 2008. Donnelly, Judy, and Sydelle Kramer. 1990. Space Junk: Pollution Beyond the Earth. New York: Morrow Junior Books. ISBN 0688086780. Klinkrad, H. 2006. Space Debris: Models and Risk Analysis. Berlin: Springer. ISBN 978-3540254485. Smirnov, Nickolay N. 2002. Space Debris: Hazard Evaluation and Mitigation. London: Taylor & Francis. ISBN 978-0415279079. All links retrieved October 14, 2015. A summary of current space debris by type and orbit. This page was last modified on 14 October 2015, at 15:59.